Pinterest told me to buy camo pants almost 2 years ago now. When I bought them I was VERY unsure if I would actually wear them. I wore them so much in fact that I just bought a new pair. Click HERE for my new pair. See below for the inspiration for my Pinterest Told Me To recreation today. How cute and cool does this girl look? My shirt is from LOFT a couple of years ago, but sadly they no longer have it. Don’t worry though, I’m going to give you lots of shirt options for camo pants in just a sec! I thought it was a fun and little bit funky look! I’m not gonna lie, when I wear my camo pants, I feel a lot cooler than I am. The pants are powerful y’all. And, I was wearing my favorite bracelet HERE. You can find a similar watch HERE. I also feel cooler when I wear my converse. 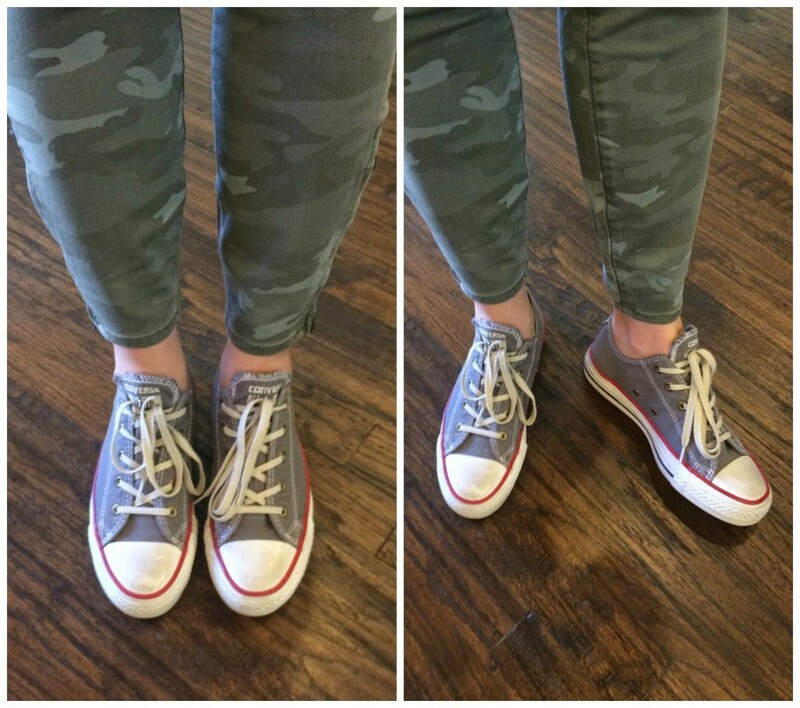 So when I wear my converse AND my camo pants together? I bought my converse last year, and again, I wasn’t sure I would wear them. For size reference, definitely order a 1/2 size down. I’m typically a 6 or a 6 1/2, and the 5 1/2s were perfect for me. I chose the grey because I wasn’t sure I could keep the white clean…and I love the grey! The women’s “DAINTY” version is available HERE. 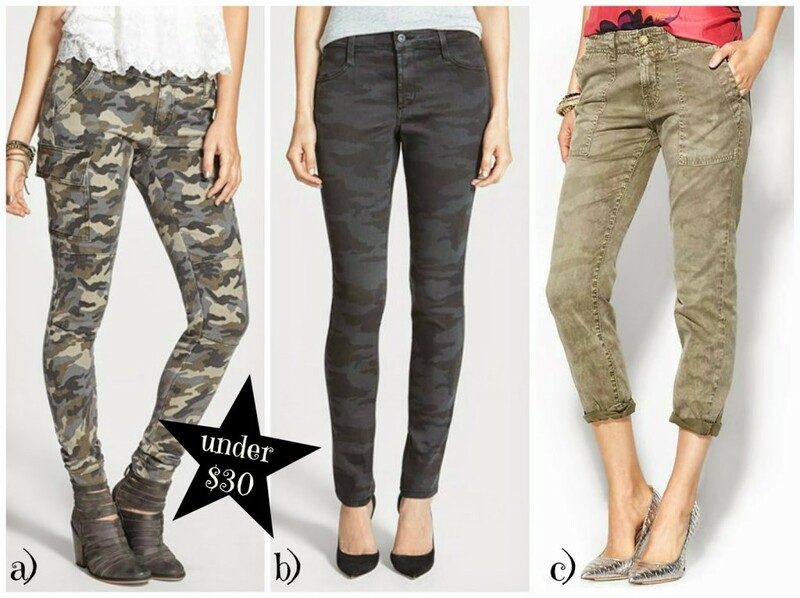 So, my new camo pants are the ones that are on the right (the modern skinny version)….and I can’t say enough good things about them!!!! They fit like a dream, they are stretchy (without being saggy), and they are comfy as all get out. Full disclosure, I wore them 3 days in a row. One of the great things about LOFT is that most of their pants come in regular, petite, and tall. I have the regular modern skinny in a size 27. I’m curvy up top, but pretty dang straight on the bottom, so I always go with the “modern” vs. the “skinny”. 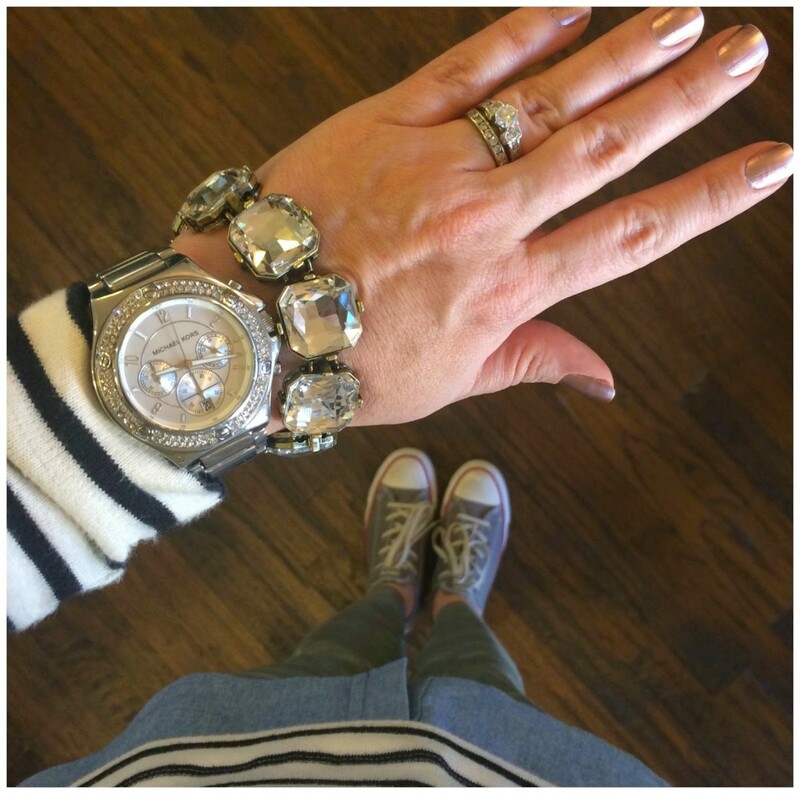 I’m 5’4″ and they are perfect to wear with sneakers, flats, or booties. Yep, they get the PTMT seal of approval. Both cuts have great reviews on the LOFT site! I’ve got 3 more for you right here! The ones on the left are only $29.40 right now! The only thing that worries about those camos on the left are the large cargo pockets on the side. If you worry about adding bulk to this party of your body, then these pants might not be for you. If you are still not quite sure about camo pants, I’m thinking this next collage might convince you. If you browse Pinterest for camo pant outfit ideas, they are EVERYWHERE. And like I said before, they just LOOK COOL. Look! Solid colors (oxblood, royal blue, and black) look great with them, and so do tees paired with denim and leather jackets or cardis. Julianne Hough is even rocking her camos with a graphic tee and a boyfriend cardi! And as you can see, you can wear all types of different shoes with them: flats (I wore THESE with mine a lot last year), sandals, TOMS, booties, WHATEVER is good! 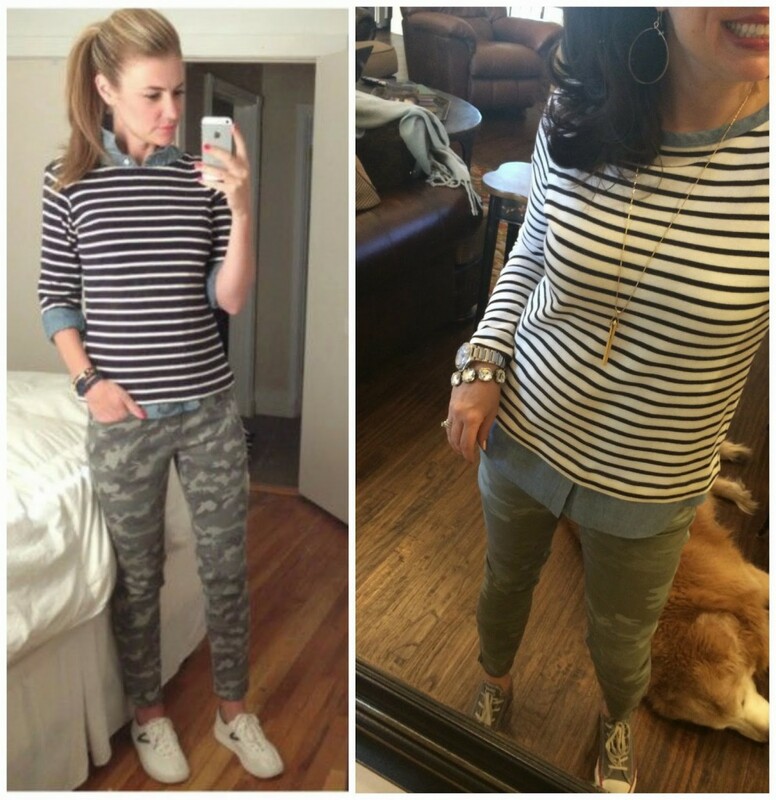 So, if you already have camo pants or you are ordering some today, I thought it would be helpful for me to give you some different options for tops that pair well with them! all look great with the camo! 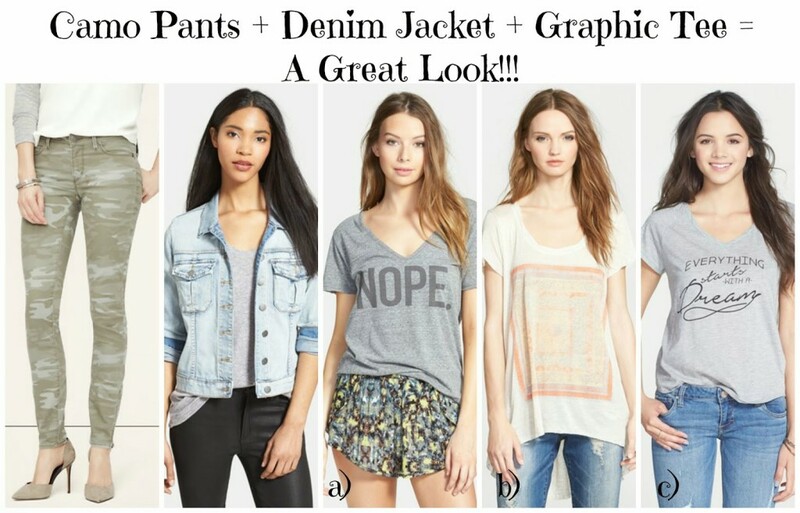 “b”, “d”, and “e” are all ON SALE and now an additional 60% OFF, no code needed!!! 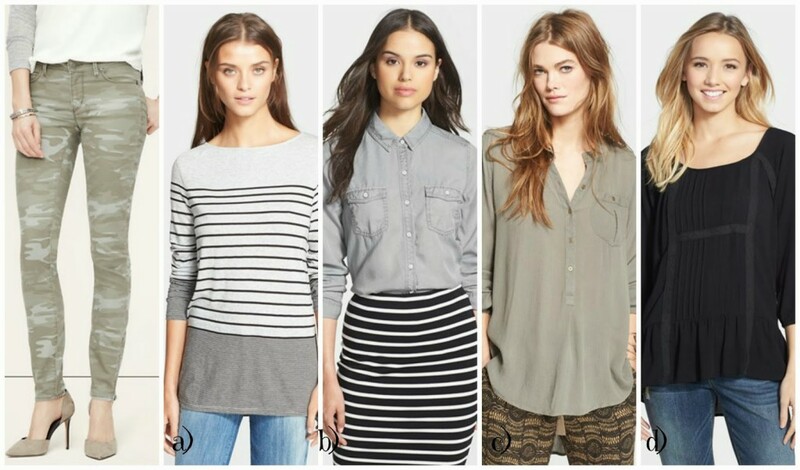 Or if you already have some or are ordering the pair ON SALE from Nordstrom, then here are some options from Nordstrom! 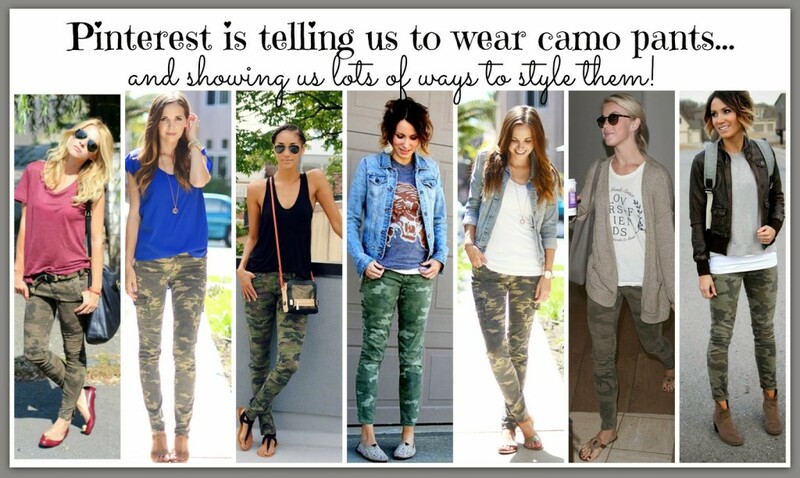 Please leave your comments with you thoughts on camo pants! Do you have them already? Do you love them? DO YOU FEEL COOL WHEN YOU WEAR THEM?!? Will you never ever ever even consider wearing them?!? If you follow me on facebook, then you saw this next collage Sunday afternoon! 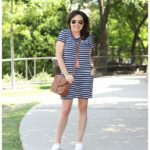 I found this maxi dress on sale, and I thought I would show it styled with some items many of you already have in your closet! THE MAXI IS UNDER $40!!!! I actually ordered THESE wedges for myself last week and they arrived on Friday afternoon. They are definitely tall (taller than I was expecting), so I’m still deciding if I’m going to keep them. They are a PERFECT cognac color, and I love the design. I’m just not really used to such a tall wedge, but the height is perfect for me (especially for maxi dresses because maxis are often a little long on me and I need the added height). Sadly, the sizes are already really picked over in the cognac color, but they are fully stocked in black. One of my long time readers (Hi Jill!) sent me a couple of pics of her in the above maxi dress in different colors. I am dying at how DARLING Jill are her entire family are!!!!! Okay….they are kind of more like GORGEOUS than darling. Right?!? Jill LOVES the dress, but she does suggest that we for sure dry clean it like the label says. She dry cleans hers and says it looks brand new, but her sister did wash hers once and the dress was ruined. 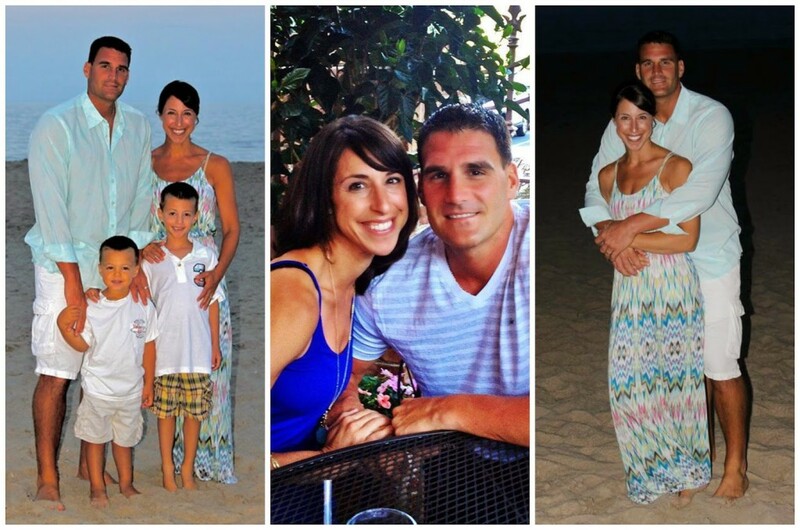 Thanks for the pics Jill! See you all back here on Wednesday for the PTMT Bachelor recap! It’s gonna be a doozie y’all because it was on FOR 3 HOURS LAST NIGHT AND IT’S ON AGAIN TONIGHT!!!!!! You know I am a big fan of camo!!! Maybe it's my country roots? Those pants are super cute! Listen, I love, love, love my camo pants! Love them! Everyone needs a pair (or two). People should listen to Pinterest. Right now. I think you've convinced me to try CAMO! But what sweater are you wearing? It's super cute! I'm so excited to recreate that first outfit this spring. I already have everything in my closet! I have a pair of Jolt camo pants (Nordstrom Juniors) that I bought last year that I wear ALL THE TIME! By far, the most worn pants in my closet after jeans! I also love by gray Converse! 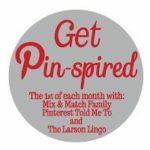 Thanks for posting all these inspiration outfits! Happy Monday!!! I don't look good in maxi dresses that have waistline. Bought a DARLING black tank sleeve one at Target this weekend. Black but they also have several colors in stripes. For some reason, not on Target.com so can't post a link but it's super cute for those who like a clean look of no waistline. Merona brand $27.99 but I believe 20% off! Thanks for the rec on the Loft camo, I have a gift card from Christmas that I haven't used yet. I love my camo pants. I got them 2 years ago because YOU told me to! I have found that when I listen to you I never regret it! My latest regret is not listening to you and ordering those pink jeans a couple of weeks ago before I went to work. By the time I got home they were sold out in my size – ugh! Next time I'll be late for work but I'll have my buy!!!! LOL – have a wonderful week – I just adore you!!!! Those wedges are FABULOUS!!! ? ok, you sold me! I would like a 40% sale though… I'll be watching and waiting to get those camo pants! Cute pics, and your reader is super cute too! I wish I was brave enough to wear camo pants,but living in Alabama…I feel like the only time I can wear camo is when I'm heading out to the shooting house for deer hunting! 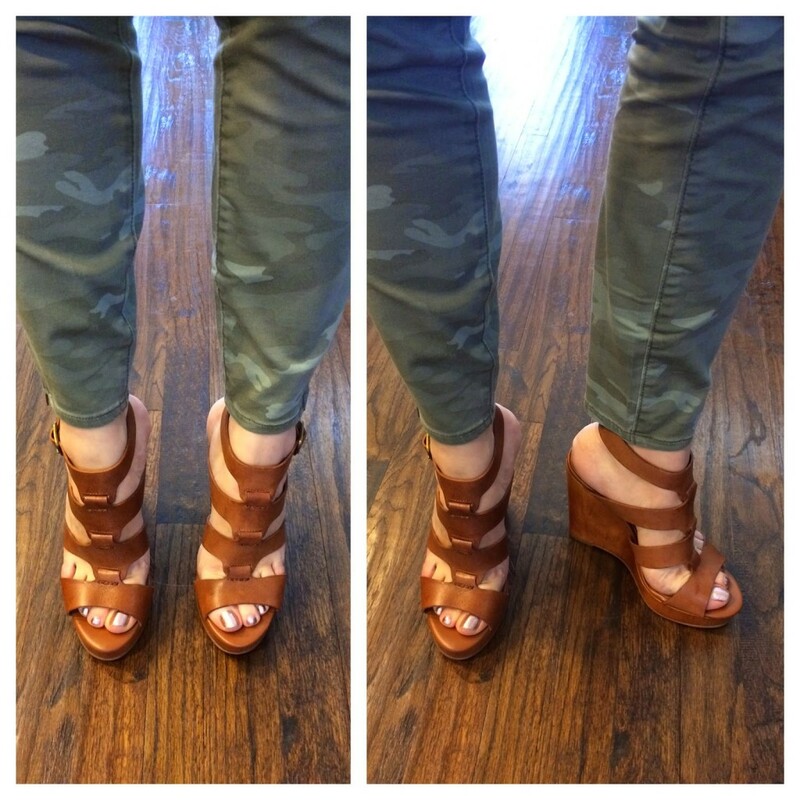 But those wedges are to die for…they're my favorite shoes for Spring/Summer! Every time you do a camo post I'm tempted but haven't been brave enough yet! Really hope you are in the hunt for some new must have wedges….I love mine from your prior year must haves but seriously have worn so much I think they have about exceeded the useful life! 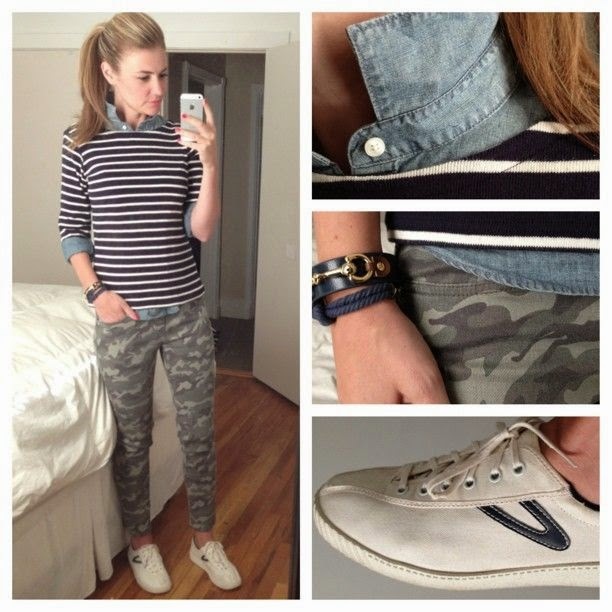 I'm one of your fans that is over 50, and although I love camo pants, I feel that this is one post that I can't be tempted by. Such cute outfits though. I'm almost 44 and was going to buy a pair. Maybe I'm fooling myself to think I can pull them off. I am staring down 49! I have a pair that I adore and are the second most worn pants in my closet (behind jeans)!!!! Go for it!!! I'm going to go for it….I figure I feel young and 44 is actually the new 22! =) I really wanted the dark (black/grey) pair that was profiled from Nordstrom, but they are out of size 26 (I thought the darker version might not scream I'm trying too hard). So, I'm going to buy the pair from Loft and live on the wild side. To the anonymous commenter above….I am 37!!!!!! GO FOR IT!!!!!!!! 🙂 And Yay Wendy!!!!! Oh, and most importantly, Sheaffer, YOU rock those camo skinnies! So, I might just have to join in. 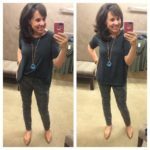 I did buy the treasure & bond skinnies you featured last post from your Nordstrom clearance picks. Can't WAIT to try those on! My heart belongs to Hudson jeans, but you featured a commenter who felt the same way and now lives this T & B pair, so I'm anxious for UPS to show up at my doorstep :))) thx for that, Sheaffer! you are adorable in those camo pants! I just can't get on the band wagon, I feel like I'm a little old to be wearing that style! But if was younger, I think I'd be all over those! Cute wedges! They look too high for me too, but love the color! Thanks for the post as always! Fun read! 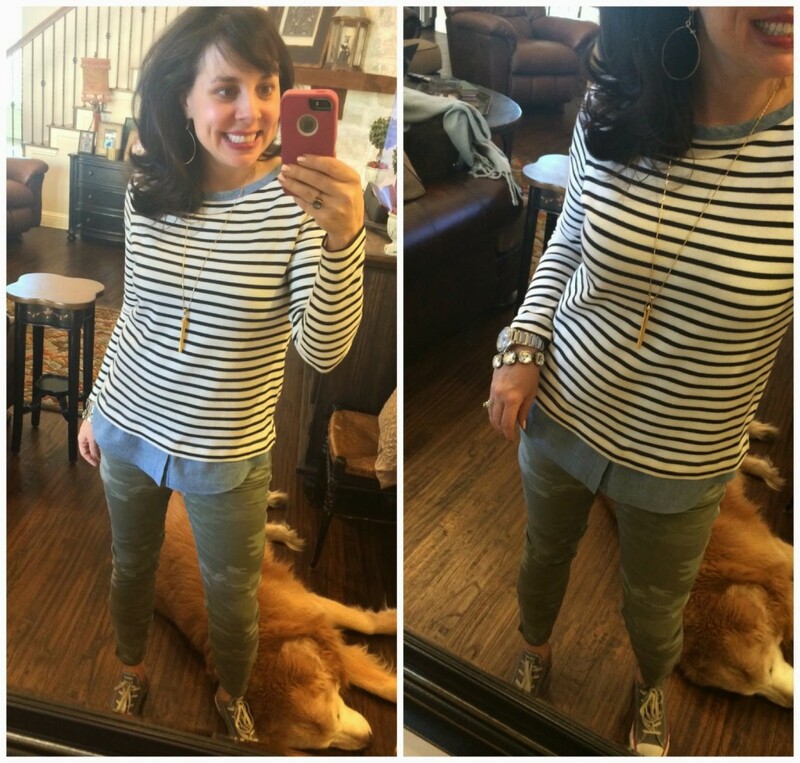 Ok, can't get on board with the camo pants YET, but I did click and buy the black and white striped 2 in 1 sweater from LOFT…extra 60% off?!? $18!!!!! I'm so glad you did a post on the camo pants. 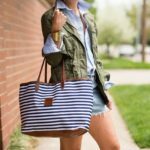 I purchased a pair from Loft about 3 weeks ago and I LOVE them! I wore them with a black top and black booties! Thanks for giving us other options to wear with camo! I love the maxi dress, but wonder what people wear for a bra with it? I gave never found a comfortable strapless bra that didn't need to be adjusted all the time, which just ruins the easy-going comfort of a maxi dress. I have 3 of the maxi's and just wear a regular bra. Its comfy and v the dress straps are more noticeable than the bra straps. Thanks for the tip. I ordered my size 4. What a deal…can't wait! 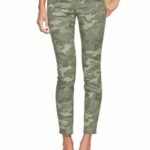 I have a darker pair of Camo pants that I bought at Target – Merona brand, skinny style. So cute and I love them! 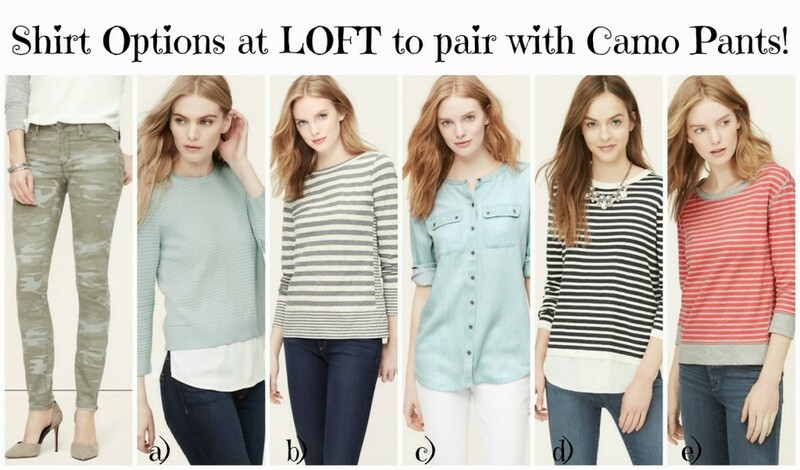 I'm thinking I need the lighter pair from Loft for spring and summer! The grey Converse will be added to my closet soon. 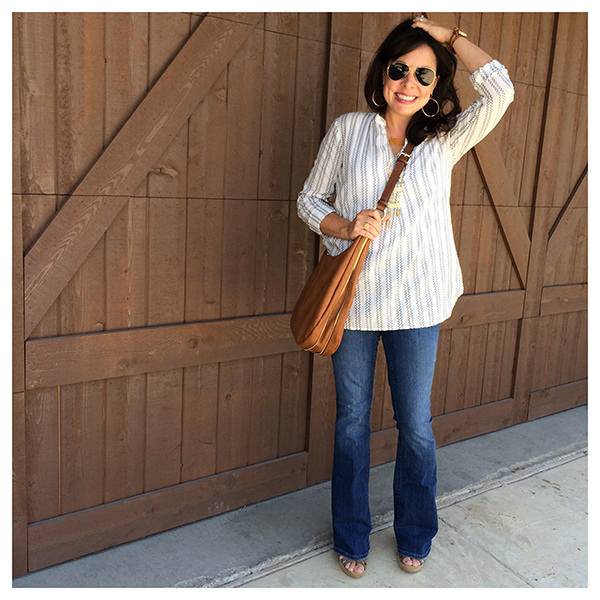 I just got the Vigoss tomboy distressed jeans – LOVE!! Hey Shaeffer, I love the camp pants and I have a pair. I am a teacher so I have always worn them as weekend wear. Just wondering if you would wear the camp pants to work or not? I think I might give it try and pair it with a dressier shirt. What do you think??? I think the camo pants are super cute…but I just can't bring myself to wear them. I am a transplant from CA, living in MT…and there is just too much camo here to feel like I want to wear them. Maybe when we move from here I can jump on board because…they ARE really cute! I had to comment because I laughed when you said you feel a lot cooler than you are when you wear your camo pants! ha! I feel the EXACT same way! I bought a pair from H&M at the beginning of the Fall season and have only worn them a handful of times. But I definitely feel like I'm not cool enough to be wearing them, but LOVE them! Thanks for the different styling idea's! 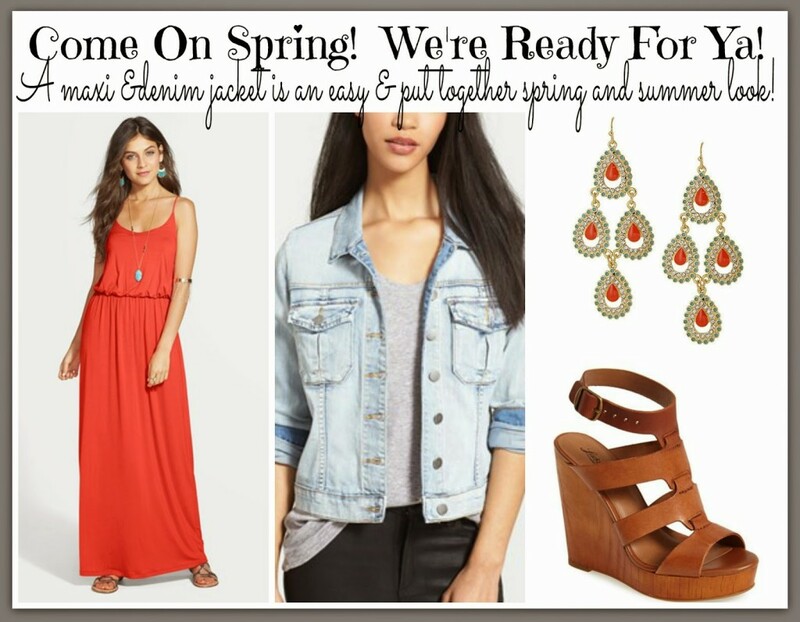 I also have the maxi from Nordstrom in two colors! It should be considered as a MUST HAVE! I have the cobalty blue color and LOVE it! It got me through my transition of just having a baby to getting back to my normal clothes and has worked every since! Great pc to dress up and dress down! However, I have the brighter coral color as well and its a little thin. Not near as forgiving, but still very pretty! I love the lush maxis! Purchased two last year and wore them all summer long and into the fall with my denim jacket. I also made the mistake of washing one at home. Forgot to check the label because it doesn't feel like dry clean only fabric. I hung it to dry, but it shrunk and is way too small now. Definitely dry clean!! This is just one item I don't ever plan to have in my closet. Each to their own eh?! What I am excited about is your bachelor recap this week. 5 hours worth of material!! I picked up that pair of camp pants from Loft a week ago and walked around the store debating them because I didn't know if they would still be in this spring…darn! I should have just bought them! Love my Loft camo pants from last fall and I have the Loft top you are wearing. But I need a shoe option. It's way too cold to expose my ankles just yet. Hi IKristin! I've never worn mine with tall boots, but I'm not sure why I haven't. What about booties? Still too much ankle showing? Duh, of course booties. I have the brown heeled ones with the straps you got at the Nordstrom's half yearly(?) I bet those would work nicely. Thanks!! I bought the curvy skinny because I have the hips! We'll see! I also bought this shirt to wear with it! http://www.loft.com/lace-sleeve-tee/360366?colorExplode=true&skuId=17876407&catid=catl000052&productPageType=saleProducts&defaultColor=6600 …………….Because what better to go with camo than black lace! I love reading all of these comments! There are almost as much fun as your blog. I'm afraid I fall in the "I Don't Think I Can Pull These Off Camp" when it comes to the camo pants. They are adorbs on you, but I just can't see it for me… Maybe it's the geography? I'm not sure Seattle is ready for 45 year old moms to start wearing camo pants. But I'm totally warming up to the idea of the military jacket! Baby steps!